Last Friday I was to attend and speak at a seminar on Aja, here in Mumbai. It was the start of a weekend, and traffic conditions in the Western suburbs were at an all time disarray. Some said there was a large procession of some kind. Anyway, I got stuck in bumper to bumper traffic, ran out of fuel, and eventually gave up trying to reach the venue. But I had my piece prepared, so I promised the organizers, Genesis Forte, wo represent Aja in India, that I would post it in this blog. Here it is. Among the most innovative products that Aja makes, is the Ki Pro and it's small sibling, the Ki Pro mini. 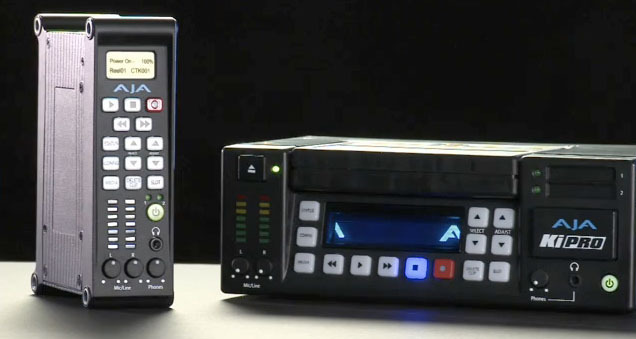 These are video (and audio) recorders which take input as component, SDI, HD-SDI, or HDMI, along with embedded or unbalanced XLR audio. And record to hard disks or SxS or CF cards. The recorded material is an Apple ProRes Quicktime movie. And you can set up Ki Pro to record as ProRes Proxy, ProRes LT, ProRes, or ProResHQ. ProRes is described later in this piece, below. 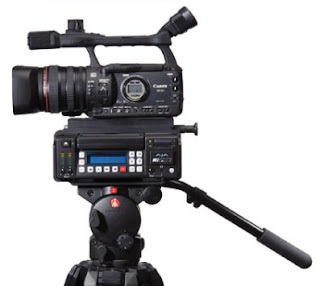 The source for the KiPro could be almost any camcorder that has an HD-SDI, or HDMI output. So basically the Ki Pro or Ki Pro mini let's you record at a quality higher than the camera's own compressed recording does. Two prime new candidates for using the KiPro with, are the new Sony F3 or Panasonic AF 101. The combination of Sony F3 or Panasonic AF 101, with Ki Pro or Ki Pro mini can challenge the Arri Alexa on quality and price. But this is not what I was going to focus on. This much is well known about the Ki Pro or Ki Pro mini. I had some alternate uses in mind for these recorders. Many TV Commercial makers use the video assist to do a rough cut before the film gets processed and telecined. In place of a video assist recorder, which is usually a DVD recorder, a DV or HDV recorder, both of which are cumbersome and linear. You can use a Ki Pro or Ki Pro mini, to record the assist video as ProRes proxy. Which is good enough quality. A 250 Gb HDD in the Ki Pro records over 11 hrs. And shots are one per clip, so capture before editing is quick and easy. If you shoot with a Alexa, it records ProRes 4444. These files are large and hard to edit on slower machines. So you can attach a KiPro which can record ProRes HQ as a backup. Or ProRes Proxy for low res editing. And if you are recording as Arri logC, you can take a linear video out via HD-SDI and plug that into the KiPro. So you're ready to edit with smaller files which are linear and not low contrast ones that the Alexa records. I know I know, log files need to be colour corrected before they can be used, but try telling that to a client who's in a hurry. The last two uses I mentioned, would need some care to ensure that time code is kept the same on the main device and the Ki Pro or Ki Pro mini. You may have shot the rest of your film on a small EX1 or EX3 or even Canon 5D or 7D - in XDCamEx, AVCHD, DVCProHD, or HDV, But if your film has green or blue screen, (chroma key) you may run into problems with recording that on those cameras. That's more to do with the recording in these cameras, not the cameras themselves. Chroma Key shots need clean edges for keying. Compression in those cameras makes the edge around objects hard to key. Recording as full 4:2:2 10bit on the KiPro or KiPro mini can give you cleaner keys in post. So better to shoot chroma shots as ProRes or ProResHQ in a KiPro for better keying. Even the keying needed for by a Colourist for secondary colour correction works better if the media is ProRes or ProResHQ. Over the next few weeks or months at most, leading TV channels in India will transition to HD. In general, all channels will no longer require producers to submit tapes for HD programming. Some will, instead, accept finished shows and rushes as files - ProRes HQ. 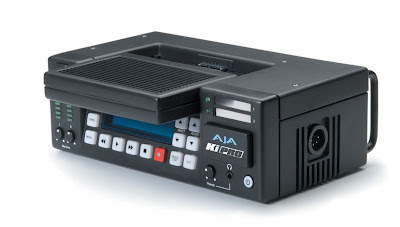 So it may even be a good idea to use the Ki Pro as your main recorder even if you shoot P2, AVC-Intra, or HDCam. Editing is instantaneous, the editing machine doesn't need any capture card, and best of all, handing over of all rushes is easy. When you need to telecine film to video in a format that's ready for delivery, like Apple ProRes that many TV channels need, the Ki Pro is a natural choice. You can even connect audio from a sound follower and embed it, so you can even get Dolby 5.1 audio along with video, all synced and ready to go. Can be carried like a recorder or portable VTR, or attached to a special exo skeleton and placed under a camera on a tripod. It has a removable 250 or 500 Gb Hard disk, or a SxS card slot to record video on. Attached behind a camera like JVC, Sony, P2 etc, and records higher quality that the camera can. especially for the new Sony F3 or Panasonic AF101 that shoot XDCam and AVCHD respectively. For those who don't yet know ProRes is a format invented by Apple for use as a high quality 10bit movie format but providing nearly uncompressed quality. Disk space and disk speed requirements are modest and feasible with ProRes. There are 5 variants yielding differing levels of quality while taking up different amounts of disk space. ProRes is 10-bit, many other codecs are 8-bit. Capacity of hard disks and cards. Ki Pro records to hard disk or SxS card.